More than 400 graduates have completed Bachelor’s and Master’s degrees at the Faculty of Computer Sciences and Automation this year. 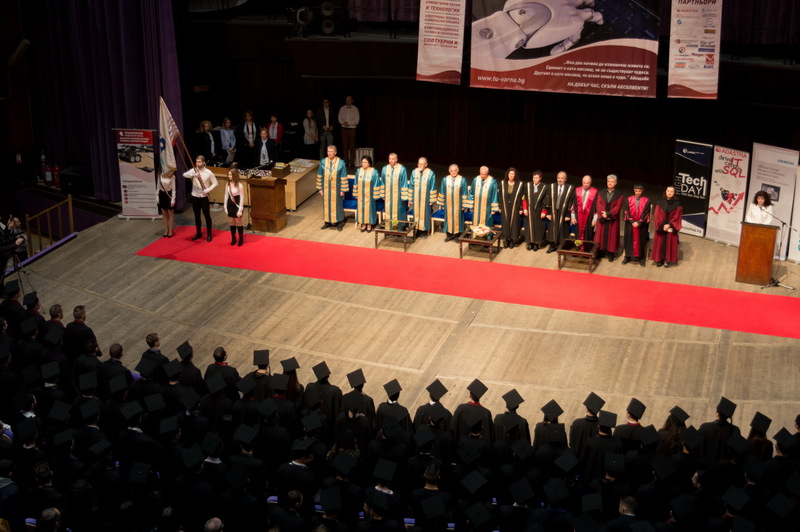 The Graduation ceremony took place on 04.04.2019. in the emblematic Hall No 1 of the Festival and Congress Center – Varna. The Ceremony was attended by the Rector of the University – Prof. Ventzislav Valchev, Vice Rectors: Assoc. Prof. Maria Marinova, Assoc. Prof. Todor Ganchev, Assoc. Prof. Kiril Kirov and Assoc. Prof. Toshko Petrov, Dean of the Faculty – Assoc. Prof. Nedyalko Nikolov, Vice Deans: Assoc. Prof. Marina Todorova and Assoc. Prof. Milena Karova, Head of Departments, Representatives of Companies -Partners, parents and guests. The Rector welcomed the graduates and awarded the golden badges to TU-Varna’s seven graduates who have completed their study with the highest grade possible – 6.00, as follows: Sasha Valcheva, Denislav Trifonov, Blaga Valcheva, Zlatomir Zlatev, Kalin Kalinkov, Yasen Kalinin and Krassimir Dimitrov. The Dean of the Faculty – Assoc. Prof. Nedyalko Nikolov awarded the diplomas and silver badges to 71 graduates with a grade point average of over 5.50 as well as to the other graduates. The final stage of the ceremony, as with any such ceremony, was the throwing of the graduation caps in the air as a symbol of exaltation through the acquired knowledge. Graduates, congratulations and good luck!